If you’ve ever marveled at the responsiveness of your horse’s ears — the way they prick up for tiny sounds or flatten when it feels in danger — you realize how important these structures are for processing information and communication. Without good hearing, your horse will miss your vocal cues. Horse ears are more complicated than those of humans. Your horse catches sound waves in her pinna, the external, cupped part of the ear that’s made of cartilage. Horses use 16 ear muscles to rotate their pinna and catch sounds. To keep your horse hearing her best, watch out for these equine ear conditions. Chiggers, ticks, mites and other external parasites are one of the most common ear problems in horses. Look for irritability, head rubbing and shaking. Some types of mites inflame horses’ ear canals, causing a shaking head and drooping ear. Mites aren’t always visible, as they live down near the eardrum. To examine your horse’s ear canal, an equine veterinarian will need to sedate the horse. Blackflies are tiny gnats that feed on blood. Small as they are, their tiny mouths cause painful bites on horse ears. Small, hard bumps form with a central bloody, itchy crust. You might notice bites on the tips of your horse’s ears. Spare your horse the pain by keeping her environment clean and using fly repellent. Ticks can attach to the pinna or dwell down in the ear canal. A special soft-shelled type, the ear tick, infests horses. Like mites, tick infestation can also cause head rubbing, shaking or droopy ears. Infections in the guttural pouches, a pair of air sacs in the horse’s neck just below the ears, can spread to your horse’s middle ear. These infections can be fungal or bacterial. As the infection migrates downward, it can inflame part of the skull, causing excessive bone to form and eventually fusing two bones together at the temporohyoid joint. Eventually, this can lead to neurological problems. Catch ear infections before they progress this far by paying attention to your horse’s symptoms. Look for head tossing, chomping, ear rubbing and pain around the base of the ear. Your horse might hold his head tilted, seem depressed or dizzy and walk in circles. You might notice drooping lips and ears or drooling. Call your equine vet at the first sign of ear-related symptoms. 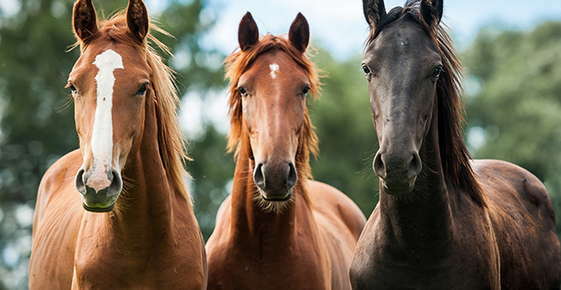 Horses can lose hearing due to age, ear mites, certain antibiotics and genetic susceptibility. Middle-aged horses of 15 and up often begin to lose their hearing. If your horse has lots of noise exposure, this loss could happen sooner. High frequencies are the first to go. Loss of this sound range may leave your horse confused about whether a sound is coming from in front or behind. If you suspect your horse has hearing loss, make your commands extra loud and articulate. Be aware that your horse may not be able to detect important noises, such as oncoming vehicles, the sudden appearance of which may spook them. Problems of the salivary glands and guttural pouches may spread into the ears, and are another cause of hearing loss. Aural plaque is usually only a cosmetic issue, which bothers the owner more than the horse. A crusty white plaque over tender pink skin appears in the ear. Occasionally this chronic condition causes ear sensitivity. If this happens, your horse may shake her head and avoid a bridle. Aural plaque is probably caused by papillomavirus and spread by flies. During summer, frequent fly bites aggravate the condition. If your horse develops aural plaque and sensitive ears, you can treat the tender skin with ointment. Some owners buy their horses special ear covers to wear when outside. Ear covers prevent further bites. You can keep your horse stabled at dusk and dawn, when blackflies are at their most active. Horses generally dislike having their ears touched. For this reason, unless you see signs of something amiss, leave well enough alone. This includes clipping ear hair, which serves the important function of filtering out bugs and dirt. If your horse has painful, fly-bitten ears, talk to your equine veterinarian about the safest and gentlest way to clean the cuts. You can also try lotions with fly repellent, if your horse allows its application. If you’re seeing head shaking, discharge or painful sores on your horse’s ears, call our office today. We can find the cause of the problem and get your horse back on the path to health and happiness.